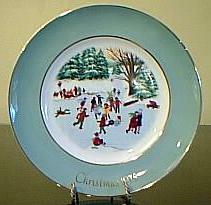 Christmas 1975 Plate Series Skaters on the Pond made by Enoch Wedgwood (Tunstall) Ltd. England. Original box - excellent condition. Plate is 8-3/4 inches round.